Japanese have always loved their bananas, having consumed 970,000 tons of the tasty tropical fruit in 2007. That figure will surely rise thanks to the popularity of the Morning Banana Diet. What began with a posting at popular social networking site Mixix has grown exponentially - four books on the banana diet have racked up sales of over 900,000 so far this year and, according to Hiromi Otaki of Dole Japan Co., banana imports have leaped 25 to 27 percent in the past few months. Enthuses Otaki, "Summer and winter are tough seasons to sell bananas, but this past summer was just incredible." Hitoshi Watanabe, 31, was the very first to try the diet on the recommendation of his then-girlfriend (now wife) Sumiko - to this point he's lost 38 pounds. Shortly after the diet began to show results, he posted his experience and the banana diet's rules at Mixi and the rest, as they say, is history. Says Watanabe, "I never imagined my posting on the Internet could change so many peoples' lives." Weight loss diet fads come and go regularly in Japan but the Morning Banana Diet is showing unusually long legs, likely due to popular singers and celebrities who have come out in support of the diet while showing off their newly svelte bodies on the TV talk show circuit. 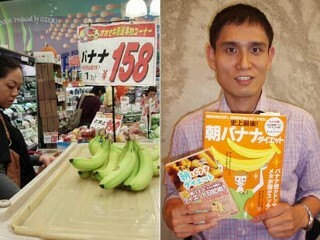 Akihiro Takenaka, who's the produce manager at the Ozeki supermarket in Tokyo, states that demand for bananas is so strong the supply can't meet the demand. 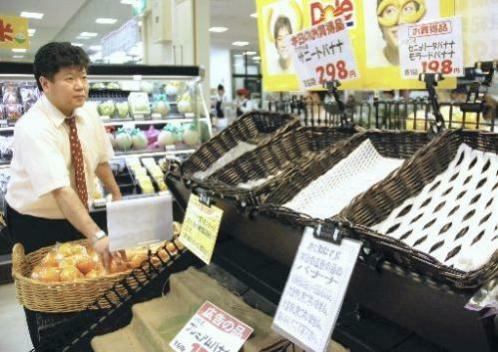 Says Takenaka, "I have been in the produce business for almost 20 years and I have never seen this kind of phenomenon." Just what is the Morning Banana Diet? In a nutshell, eat as many bananas as you want as breakfast each morning, along with room-temperature water.If you don't have a nutshell, just peel & eat while holding them in your hand, heh. Lunch and dinner can be whatever you like and need not include bananas; the only proviso is that dinner be finished by 8pm. Go to sleep before midnight, wake up the next morning and start again with the bananas. Pretty simple as diets go! 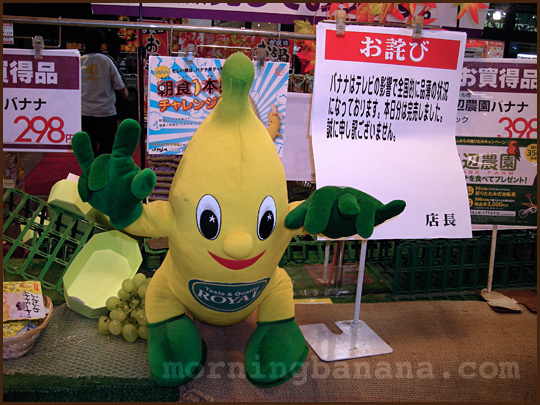 The Morning Banana website was set up by Americans living in Japan and provides, in English, copious info on the diet along with hints on how to adapt it for those living in the USA. The site includes journals where dieters can chart their progress and discussion forums where info is exchanged and questions answered. Any diet will work if you follow the plan, but what happens afterwards? Most people regain some or all, or even more, of the weight they just lost. To get the weight off and keep it off, you have to figure out what's eating you so you can stop eating. Check out www.WhyAreYouWeighting.com to learn how to get rid of your baggage so you can get rid of your weight!